Silk Road Dance Company creates special programs for museum exhibitions. Our extensive dance repertoire and costume collection cover a wide range of ethnographic and historic styles. The Sackler Gallery of the Smithsonian featured Silk Road Dance Company in their inaugural ''Asia After Dark'' series. SRDC selected dances to compliment the ''Gifts for the Tsar'' exhibit from the Kremlin that included art from Imperial Russian, Ottoman Turkey, and Saffavid Persia. Silk Road Dance Company performed ancient Egyptian dance reconstructions at Chicago's Field Museum and the North Carolina Museum of Art in connection with the British Masterworks Exhibition of Ancient Egyptian Art. At the Houston Museum of Fine Art, Silk Road Dance Company presented an evening program of dance from the Silk Road. The Asia Society in New York presented Silk Road Dance Company in two programs of dances and tales to compliment an exhibit on Kashmiri art. Silk Road Dance Company was honored to participate in the Textile Museum's annual Family Festival of Textiles. In addition to Central Asian dances, the ensemble's dragon also made an appearance, to the delight of young audience members. Baltimore's Walters Museum often calls upon Silk Road Dance Company for family programs, including themes from Greek Mythology. Persian New Year concerts are another popular event. Since 2006, Silk Road Dance Company has crafted unique Persian Norooz concerts for family audiences at the Philadelphia Museum of Art. On September 15, 2012, Silk Road Dance Company presented two special programs at the National Museum of African Art. The first presentation featured North African dances from Algeria, Tunisia, and Morocco. 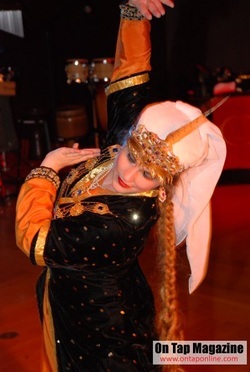 SIlk Road Dance Company premieres two new Algerian dances, including a Kabyle piece in authentic costumes gifted to the ensemble b the Algerain American Association of Greater Washington. The second program consisted of folkloirc dances from Egypt.